Guests have fun, fun, fun at Hot Dog Park! The V.I.Pet Resort features "Hot Dog Park." This themed indoor play area is where our Doggie Day Care guests can get plenty of exercise and play with other dogs of the same size rain or shine. "Hot Dog Park" has 3 seperate play areas for small, medium and large dogs. We also offer a "private" playtime option for our guests who prefer to play with staff members only. This themed indoor area ensures that your pet can play and exercise everyday regardless of the weather! 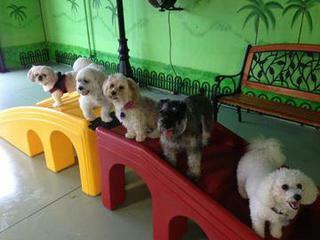 "Hot Dog Park" is staffed and supervised by trained staff at all times. When you book your daycare day, we will book a suite at no extra charge for rest time and feeding if needed! Reservations are required in advance as we do fill up! *All dogs must be spayed/neutered in order to participate in group play activities. Private play is also available. We also offer a Spa & Play Package where your pet can play for the day with friends and then be pampered at Milo's before going home. This option gives you a half price rate on Doggie Day care when combined with a visit to Milo's Spa! *10% discount available for Military and 1st Responders. Thank you for your service!